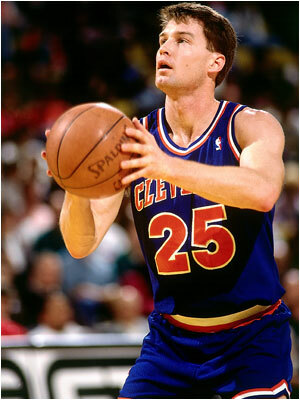 It is commonplace now for NBA point guards to split the two defenders on a pick and roll play, compromise the defense by penetrating the lane and then either shoot a runner or dish to a wide open teammateâ€”but most people donâ€™t realize that Cavaliers guard Mark Price brought this split technique to the forefront. Amazingly, the first time he pulled off the maneuver it was an accident. Johnny Bach, who was the de facto â€œdefensive coordinatorâ€ for the Chicago Bulls during their first three-peat, says that the Mark Price-Brad Daugherty pick and roll combination was â€œthe best in the businessâ€ because of Priceâ€™s unique ability to split the trap and get the defense back on its heels. Daugherty breaks the play down from a technical standpoint: â€œMark was obviously a tremendous ballhandler and in order to get through the double-team you just have to have a great angle and a great pick. Your big guy has to set the pick and hold the screen and give the guy time to get through. A lot of times when you run the pick and roll, your forward or your center is looking to roll immediately because after you set the screen you are wide open. Itâ€™s hard sometimes to go over to that point guard and really hold on to that screen because you know that as soon as you roll that you have a chance for a shot. I think that the number one key is making sure that the guard doesnâ€™t move until the big guy sets the screen and once the screen is set in place that the big guy does not move until the guard comes off of his hip. It is easy to split it that way because as the big guy sets the screen the big guy guarding him–the other center or forward–has to pick up the point guard. Usually that big guy will drop off because he knows that the point guard is quicker than he is. That creates a gap and Mark was just really good at cutting through that gap.â€Defenders did not dare to go under Daughertyâ€™s screens because Price was a great three point shooter, nor was fouling Price a good answer because to this day he is still the leading free throw shooter in NBA history (.904). In 1988-89, just his third pro season, Price shot .441 from three point range (third in the league), .901 from the free throw line (fourth in the league) and .526 from the field (16th in the league). Larry Bird, Reggie Miller, Steve Nash and Dirk Nowitzki are the only other players who have ever shot at least .400 from three point range, .900 on free throws and .500 from the field in the same season. Price earned four All-Star selections (1989, 92-94) and he also made the All-NBA Team in each of those years, including a First Team nod in 1993. Price led the league in free throw shooting three times, ranked in the top ten in assists on five occasions and won the All-Star Three Point Shootout in 1993 and 1994. His shooting and playmaking skills earned him a spot on Team USA in 1994, the last time that the United States won the FIBA World Championship. Price led Team USA in steals (12 in eight games) and ranked second in three pointers made (19), second in assists (29) and sixth in scoring (9.6 ppg). Shaquille Oâ€™Neal (18.0 ppg, .713 field goal percentage) and Reggie Miller (17.1 ppg, 30 three pointers made) were the teamâ€™s top two scorers. Price averaged 17.4 ppg and 7.0 apg in seven playoff appearances with the Cavs. He had a particularly outstanding postseason in 1991-92, averaging 19.2 ppg and 7.5 apg while shooting .496 from the field, .362 from three point range and .904 from the free throw line in 17 games. The Cavs made it to the Eastern Conference Finals but lost 4-2 to the Chicago Bulls, who eliminated the Cavs from the playoffs five times during Priceâ€™s career. Magic Johnson once predicted that the Cavs would be the team of the 90s but the Bulls went on to claim that distinction, winning six titles, including two in seasons during which they eliminated the Cavs. Price averaged 15.2 ppg and 6.7 apg in 722 regular season games during his 12 year career but during the eight years that he was Clevelandâ€™s starting point guard he averaged 17.6 ppg and 7.8 apg, including 19.6 ppg and 9.1 apg in 1989-90; those numbers would earn a player MVP consideration today but Price did not even make the All-Star team that year (the East backcourt consisted of Michael Jordan, Isiah Thomas, Joe Dumars and Reggie Miller). In comparison, Steve Nashâ€™s career averages after 12 seasons are 14.3 ppg and 7.9 apg; Nashâ€™s career high scoring average is 18.8 ppg (2005-06) and his career high assists average is 11.6 apg (2006-07). Keep in mind that during the 1980s and 1990s, Robert Horryâ€™s hip check on Nash would have looked like a love tap compared to the Rick Mahorn body blow that slammed Price into a basket stanchion. What kind of numbers would Price have put up in todayâ€™s game, when perimeter defenders are not allowed to even touch offensive players? Price faced many outstanding point guards but he says that Kevin Johnson was probably the toughest one for him to defend. Of course, Price and Johnson were teammates in 1987-88 before the Cavs shipped Johnson to Phoenix in exchange for All-Star forward Larry Nance. Imagine what the Cavs would look like now if they had even one future All-Star point guard, let alone two of them!